After a limited national tour, My Perfect Mind is about to open at London’s Young Vic, an appropriately adventurous venue for so bold an experiment and just over 100 yards from where, forty-six years ago next month, Edward Petherbridge created the role of Guildenstern in Tom Stoppard’s Rosencrantz and Guildenstern Are Dead. 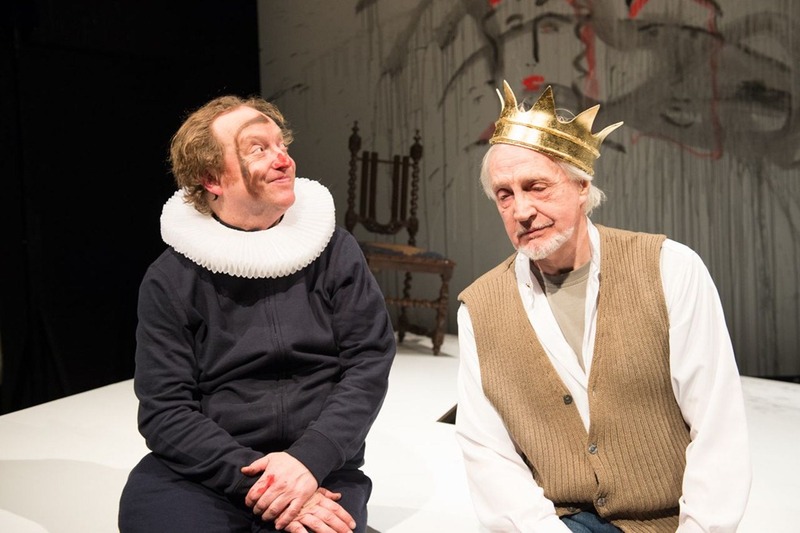 The link between the two plays is not merely geographic; each is an ingenious sideways look at Shakespeare, centred on a compelling double act that, like most great double acts, is both comic and touching. The ‘script’ of My Perfect Mind evolved almost entirely through improvisation and continues its evolution within a carefully plotted, finely honed structure. In a sense, it is one long, beautifully crafted riff. It is also a genuinely collaborative piece, one of the collaborators being William Shakespeare. 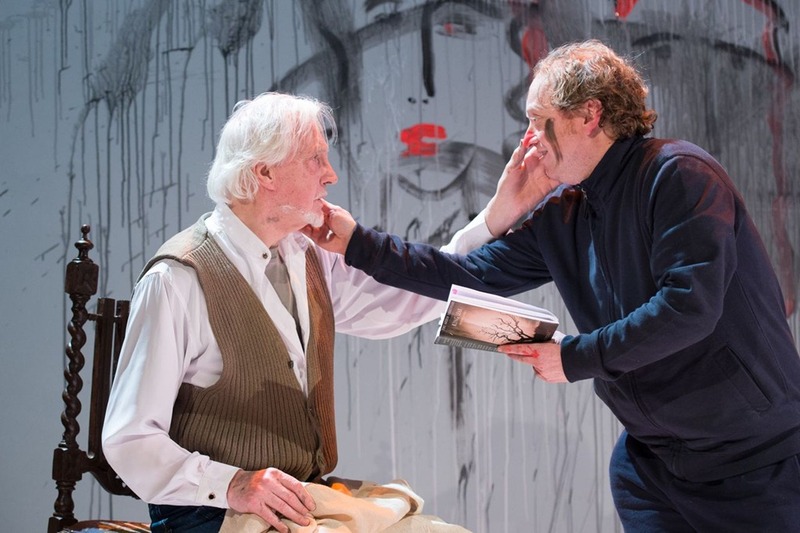 The show fuses two main plots into one unique entity: the story of Shakespeare’s King Lear and that of the stroke which prevented Edward Petherbridge, on the eve of his 71st birthday, from playing the part of a lifetime. It is the stuff of two tragedies, you might say, but forged, in the rehearsal-room crucible of creativity, into the precious metal of comedy. It is a remarkable show and one to which I feel a very personal connection. As Edward’s friend and the editor of his book, Slim Chances and Unscheduled Appearances, I am intimately acquainted with the ‘backstory’. As script consultant, I have been privileged to see the show develop from a speculative suggestion to a fully fledged creation that, in its own understated and sure-footed way, is carving its special niche in theatre history. The space between them and the actors is not the non-conductor of emotion that it often seems to be elsewhere; it quivers with communicative quickness; you do not have a sense that artist’s intention and public’s perception are fumbling for each other in a dark room; you feel the stir of a common intellectual excitement changing all the hard disparate atoms in the auditorium into one quickened brain … you feel a whole audience to be delightedly tasting flavours and valuing qualities in what they hear. In the Drum Theatre at Plymouth I witnessed a similar phenomenon. It was as though a new theatrical language had been invented but one in which the audience was innately schooled, with which they had a rare and immediate affinity. For they recognized, both in Edward’s story and Lear’s, something fundamentally human. What I offer here is not a review but a personal perspective and appreciation of the show’s essence and the imaginative intersections between its two ‘texts’. Edward’s first return to eight performances a week was in a short-lived West End production of the long-running off-Broadway musical The Fantasticks in which he played, hilariously and poignantly, the Old Actor, a tatterdemalion strolling player, a failed and forgetful Thespic alchemist clinging, with a certain magnificence, to dubious past glories. Serendipitously he was paired in this role with a born clown, Paul Hunter, co-founder of Told by an Idiot, a company with a now twenty-year history of invention and disciplined anarchy. This unlikely comic duo ‘kick[ed] the show deliciously off kilter’ and inspired critical comparisons with Beckett’s tramps and the Bard’s Lear and Fool. Lear himself, however, remained unfinished business. In the wake of The Fantasticks, Edward conceived the idea of a pocket or ‘kitchen-table’ version of King Lear, a two-man exploration of Shakespeare’s tragedy, in which he would play the King and Paul all the other parts. It would be Lear both in miniature and under a magnifying glass. But in the story of Edward’s stroke and his not doing Lear, Paul discerned the seeds of something potentially more interesting. Under the auspices of Told by an Idiot, the two set about experimenting and were eventually joined by a director (Kathryn Hunter) and a designer (Michael Vale) attuned to the spirit and regimen of serious play that characterized the initial workshops (or R&D) and later the rehearsals. My Perfect Mind. Photo by Manuel Harlan. To characterize, stylistically and structurally, the outcome of this experiment is not so easy. Perhaps the best description is kaleidoscopic. The show takes fragments of Edward’s life and, like a kaleidoscope, it reflects and refracts reality, yielding colourful patterns which, though they shift with each turn, have a beautiful symmetry and internal logic, a simplicity as well as an intricacy. In its breakneck yet delightfully discursive journey through Edward’s past and present, the transitions between scenes, and between different layers of reality, are appropriately synaptic. Its dramatis personae enter and exit in a way reminiscent of the dreamlike comings and goings of Pirandello’s characters. These personae include real-life figures such as Laurence Olivier, in his role as inaugural director of the National Theatre, and Edward’s mother, who two days before he was born suffered a stroke from which she only partially recovered and who, although she makes just three brief appearances, is implicitly the heroine of the piece. In a show that plays constantly with notions of Truth and the parameters of fact and fiction, they are fearlessly wild, fantastical approximations of the real people, but they have nonetheless a curious credibility, even authenticity. Edward’s persona, too, is a conscious, cleverly constructed approximation of his true self. 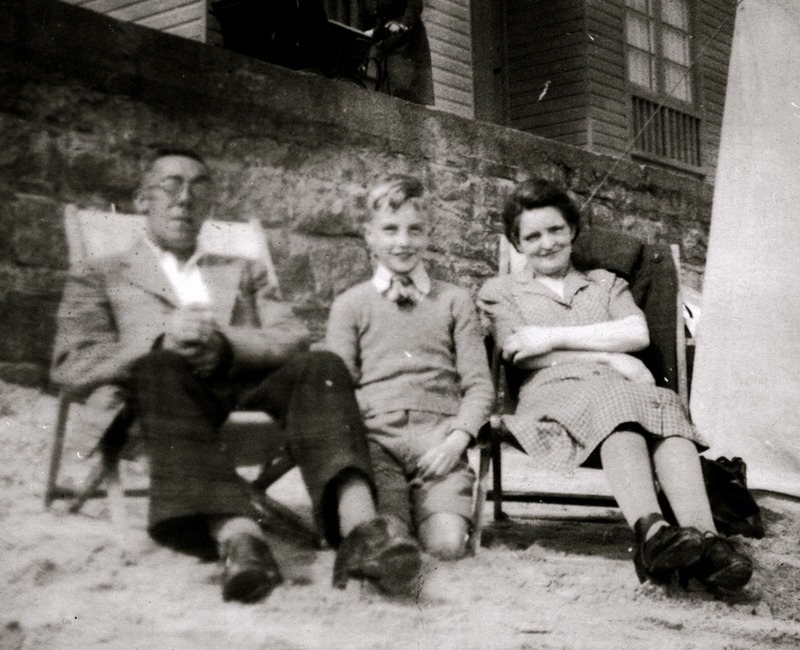 Edward with his parents at Bridlington, ca 1945. The kaleidoscopic patterns are, of course, composed, not only of fragments of Edward’s life, but also of significant shards of King Lear. The two stories do not run in parallel; rather they continually intersect or collide. 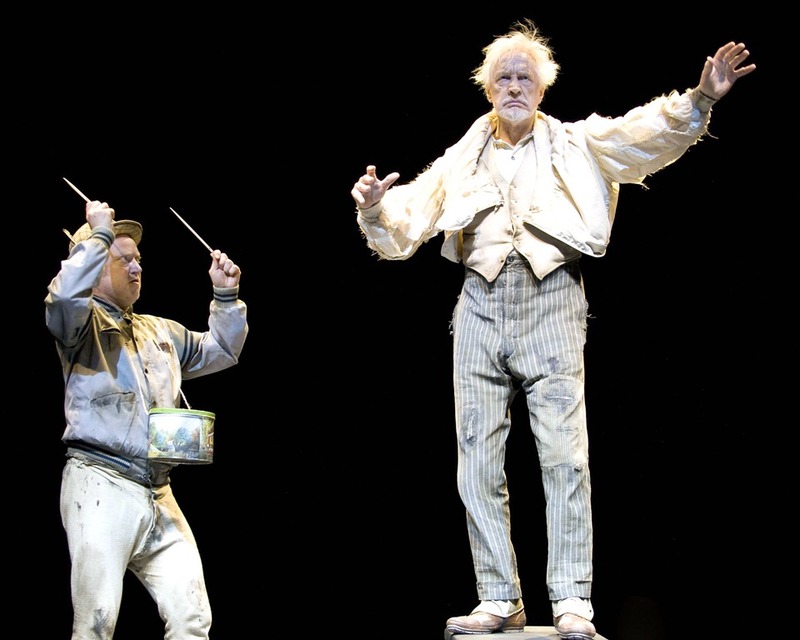 No attempt is made to portray Lear as a stroke victim or to claim for Edward’s plight a tragic grandiloquence. 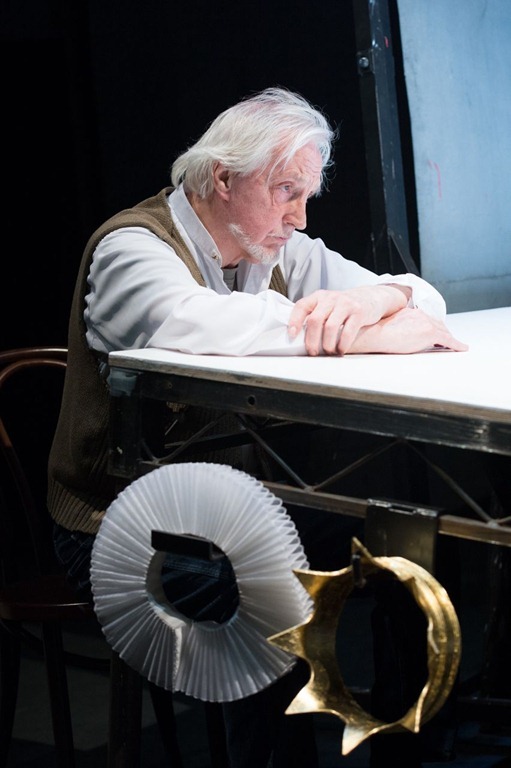 The narrative of Edward’s stroke and recovery is loosely chronological, while the Lear narrative, condensed and distilled to its essence of personal and domestic tragedy, is more linear. 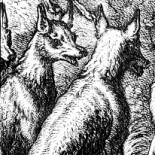 Despite the surreal contexts created for them, the Shakespearean passages are entered wholeheartedly and emerge with an unusual clarity, an unexpected purity. We begin to hear Lear’s words in a new and illuminating way, for example when Edward delivers the King’s famous prayer of growing self-knowledge, ‘Poor naked wretches’, as a recitation by his nine-year-old self. The combination or collision of these two worlds and two identities is arguably a greater undertaking than Lear played ‘straight’. Told by an Idiot’s artistic policy is ‘to explore the human condition by celebrating and revelling in a style of theatre that is bigger than life. The company seeks to acknowledge the artifice of theatre and makes no attempt to put reality on stage. We remain, however, fascinated by the fine line between comedy and tragedy that exists in the real world.’ In My Perfect Mind, the line between comedy and tragedy is at its finest, or possibly irrelevant. An extraordinary mergence of the two vocabularies, the two sensibilities occurs, one that is wholly faithful to Shakespeare’s play. In a letter to his biographer Archibald Henderson, Bernard Shaw observed: ‘[In King Lear] we find the alternation of tragic and funny dropped for an actual interweaving of the two; so that we have the tragic and the comic simultaneously, each heightening the other with a poignancy otherwise unattainable.’ This poignant mutual heightening is precisely the achievement of My Perfect Mind, in which robust comic energy and playfulness coalesce with, and render oddly more meaningful, tragic pathos. The interweaving Shaw spoke of, Albert Bermel later christened ‘comic agony’. Bermel distinguished this from ‘tragicomedy’, which merely alternates modes, achieving no fusion. More recently, John Lennard has added a further distinction, that of comedic agony, ‘where the structures of comedy as a genre celebrating survival and procreation are harnessed to deathly, childless ends.’ In My Perfect Mind, the epitome of comic agony, we have the inverse of comedic agony – tragedy harnessed to life-loving ends, to a celebration of survival and human creativity. Part of King Lear’s dramatic inheritance is a play about another mad king, Euripides’ Herakles, in which, at the moment of his greatest triumph, Greece’s most celebrated hero is struck down by a supernaturally imposed madness and forced to murder his wife and children. On waking from his madness and being made to realize what he has done, Herakles resolves to commit suicide, but through a deeper resolve and the unconditional love offered by his father Amphitryon and friend Theseus, he finds the courage to ‘endure life’. From Seneca onwards, playwrights and directors, who have approached the play, have focused their attention on the explosive madness, seeking to rationalize it in psychological terms. But the point of the play lies in what cannot be reasoned, that is, the existence of unconditional love, and in the radical possibility of forgiveness and rehabilitation. Like Herakles, My Perfect Mind is essentially about rehabilitation, about the restoration rather than the loss of self. It dramatizes, however comically and surreally, hope and a kind of salvation. William Arrowsmith, one of the twentieth century’s most influential theorists and exponents of translation, described Herakles as ‘a play which imposes suffering upon men as their tragic condition, but it also discovers a courage equal to that necessity, a courage founded on love.’ The same may be said of King Lear, in spite of the nihilistic bleakness of its ‘promised end’, which for a century and a half was considered too unbearable to be staged. There is no happy ending for Shakespeare’s Lear and Cordelia but the play’s final tableau is nevertheless a declaration of transcendent love in the midst of insupportable fortune; as Reuben Brower notes, ‘Lear dies loving and looking for life’. In My Perfect Mind we get a real-life happy ending, encapsulated in Edward’s final, focused hand gesture. It is a moment delicately underplayed, free of mawkish sentiment, but memorably moving in its affirmation of life and the healing power of art. I credit poetry … both for being itself and for being a help, for making possible a fluid and restorative relationship between the mind’s centre and its circumference. … Poetic form is both the ship and the anchor. It is at once a buoyancy and a steadying, allowing for the simultaneous gratification of whatever is centrifugal and whatever is centripetal in mind and body. And it is by such means that Yeats’s work does what the necessary poetry always does, which is to touch the base of our sympathetic nature while taking in at the same time the unsympathetic nature of the world to which that nature is constantly exposed. The form of the poem, in other words, is crucial to poetry’s power to do the thing which always is and always will be to poetry’s credit: the power to persuade that vulnerable part of our consciousness of its rightness in spite of the evidence of wrongness all around it, the power to remind us that we are hunters and gatherers of values, that our very solitudes and distresses are creditable, in so far as they, too, are an earnest of our veritable human being. Edward’s post-stroke self-portraits, 25 August and 14 October 2007. What My Perfect Mind shows us is how theatre, or indeed any creative act, has the same redemptive, regenerative capacity, confirms us in our humanity and is, in fact, a small miracle. The important thing is to keep loving and looking for life. I found this very interesting, which I was pleased about, because when I started reading, I feared my unfamiliarity with the theatre would make it all too dense for me. Instead, I found an inspiring article on creativity coming from Life’s damages and having the courage to be vulnerable. The references to literature and history gave even more depth to the piece and I feel that I learned a lot, not just about the stage, but of a unique way of dealing with adversity. And I enjoyed seeing Mr. Petherbirdge paintings, I had no idea he was as skilled in that medium, too. I had the pleasure of going to see this in London at a Wednesday matinee, and am happy to report that My Perfect Mind is an absolute knockout. Funny (hilarious in fact), moving, nostalgic, resigned – EP showed just what an actor he is. It was a masterpiece of timing, comic, tragic, whatever. And Paul Hunter too was brilliant – it was a completely unselfish two-hander. It’s a lovely little space, the Young Vic studio theatre, and I had an excellent view from my seat in row 2 – but I think everyone must have had a great seat. I laughed, I even shed a tiny tear but mostly laughed, and it was over all too soon. It was this review that tempted me to go and see the piece, so thank you – and I laughed far, far more than I expected. I went to see this a couple of days ago and so loved it. It mashed up a lot of things in my mind: reading Lear for the first time at school and weeping buckets, the frailness of the old, the absurdity of life…. As someone who has admired Edward’s work for many years (first saw him in 1962 playing Demetrius) I so regret not having been able to see My Perfect Mind. Thank you for all the help you give him – I frequently look at my copy of Slim Chances with interest and appreciation. This entry was posted on March 29, 2013 by Guest in Vulpes Randoms and tagged Edward Petherbridge, Kathleen Riley, King Lear, My Perfect Mind, Paul Hunter, Vulpes Randoms.